Four EasyDrivers on one board, with shift register inputs. Description: We needed to have an easy way to chain many EasyDriver boards together. So I came up with the EDQ, which has four EasyDriver circuits plus shift registers on one board. This allows for a single UBW board to control many stepper motors (64 stepper motors at 5KHz step rate has been tested so far). There are two 8-bit shift registers on each board. All of the boards can be daisy chained by connecting their IN and OUT connectors. (Each IN and OUT connector has Data, Clock, Latch and Ground connections - top to bottom.) There is a 5V regulator on the board. The input voltage is between about 9V and 30V. The driver chips are Allegro 3967 chips, and they are for bi-polar (4, 6 or 8 wire) stepper motors. There is a current adjustment pot that lets you set the max current per motor phase to any value between about 150 and 750 mA. (All four drivers share the same current limit.) These are microstepping chopper drivers. These boards are not commercially available at this time. However, all of the design files are located below if you wish to make your own. This version is EDQ v0.8. 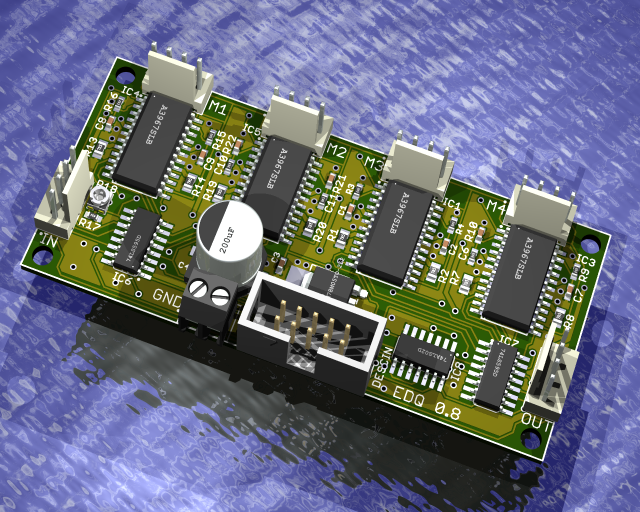 In the next couple of months (Q1 '08) I will be updating the design to EDQ v1.0 and will include several enhancements to the board.